DEERPARK (WABC) -- Authorities investigating the death of a dog allegedly found abandoned along a highway in Deerpark have arrested the person who dropped the pit bull terrier at the shelter after determining her story was a lie. 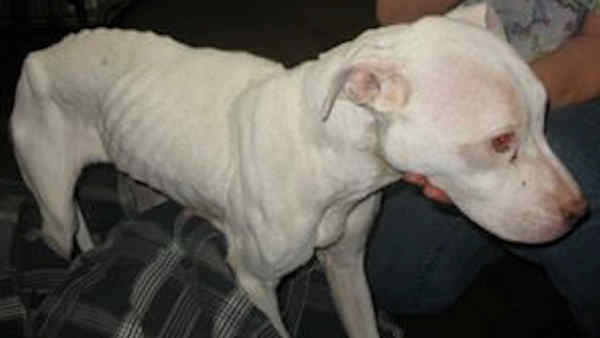 The dog, named Sweet Sally by animal hospital staff, was too abused and emaciated to survive her injuries, with officials believing she had not eaten in two weeks. According to the initial report, a driver traveling along US Route 209 near 3rd Street Cuddebackville observed something laying on the side of the road on February 24 and pulled over to investigate, where she found the dog unable to move. The dog was transported to the Humane Society of Port Jervis/Deerpark, where she began receiving emergency care. The investigation, however, determined that Sweet Sally was not found abandoned and instead was transported from her home in Matamoras, Pennsylvania, directly to the Humane Society by the person claiming to have found her. She was never left alone along the highway. Once it was determined that the came from Pennsylvania, investigators contacted the Eastern Pike Regional Police Department, and the joint investigation resulted in criminal charges against a resident of Matamoras. The Eastern Pike Regional Police Department arrested 51-year-old Rhonda Peterson, who has been charged in Pennsylvania with cruelty to animals and abandonment. She faces a fine with the possibility of jail time.